Chelsea have unveiled their new strip for next season, becoming the first English premier league side to do so. The Champions League winners have kept it simple and stuck to their tried-and-tested blue kit which takes inspiration from past shirts worn by Chelsea greats while the club crest reverts back to a four colour design. 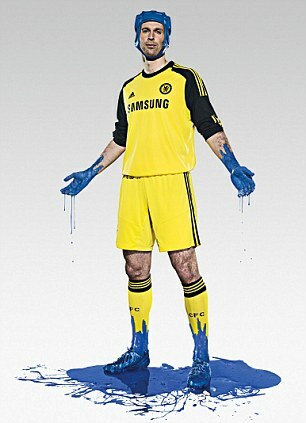 The launch follows a unique promotional campaign which saw a number of Stamford Bridge stars covered in blue paint. John Terry, Fernando Torres and Davd Luiz were joined by team-mates Juan Mata, Demba Ba, Eden Hazard, Oscar, Gary Cahill and goalkeeper Petr Cech. And the Chelsea men appeared more than happy to be covered from head to toe in the club's colours. I have really enjoyed being part of this day, I would do anything for this club and to show my passion for being a Blue means everything to me,' said Brazilian defender David Luiz. While giant keeper Cech, one of the longest-serving players in the current Chelsea squad, said: 'I can say that painted in blue, it shows how blue I can be, Chelsea is a huge part of my life and Chelsea Football Club has become like my second family.